RACO Midnight is a range of premium quality frypans with our revolutionary Hyperheat metallic non-stick surface and a stylish matte black exterior that look great on any cooktop. HYPERHEAT METALLIC NONSTICK is revolutionary non-stick technology that transfers heat faster and more evenly, so that food cooks quicker and without any nasty hotspots that can burn food. 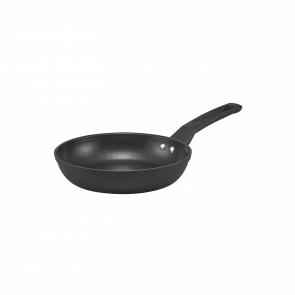 PFOA FREE NON-STICK interiors for extra durability and lasting food release capabilities. STYLISH MATTE BLACK EXTERIOR bringing a sense of classic style to your kitchen. ERGONOMIC PHENOLIC HANDLES riveted for extra strength. 30 DAY MONEY BACK GUARANTEE - If you don’t love it as much as we do, you can return to the product to us for a full refund. LIFETIME GUARANTEE on the workmanship of the product.